Jason Palmer is a regional application specialist at Delta Computer Systems Inc., Battle Ground, WA; 360/254-8688, www.deltamotion.com. Fig. 1—A new hydraulic press at Missouri Metals is capable of hot forming two parts simultaneously, with each side of the press using two hydraulic cylinders to ensure that pressure is applied evenly. The capabilities of a new motion controller make precise control of the cylinders possible. Titanium hot forming requires a high degree of precision, as the process involves heating parts and pressing them slowly in successive stages, waiting, and reheating several times. When large parts are involved, multiple hydraulic cylinders may be used to ensure that uniform positioning and force are being applied across the part. That’s how Missouri Metals, St. Louis, MO, manufactures precision titanium components for the aerospace industry. In using the hot-forming process, the company recently needed a new press to manufacture long narrow titanium parts as large as 28 by 128 in. The new press had to be capable of pressing two parts simultaneously, according to Sam Moore, Missouri Metals maintenance manager. The company decided to take on the task of constructing the new press itself, placing it in service during the summer of 2015. To handle forming two parts simultaneously, the company decided to use four hydraulic cylinders, two for each end of the press (Fig. 1). All four cylinders are used to form the longest parts. For shorter parts, the system can be split and operated as two independent presses, with two cylinders each. Fig. 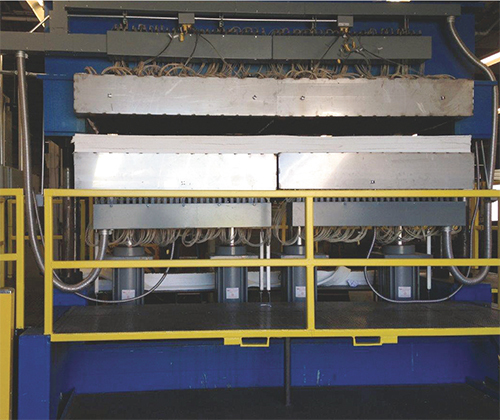 2—The motion controller on Missouri Metals’ new hot-forming press can control as many as eight motion axes simultaneously, allowing independent operation of each side of the press that enables simultaneous part production. In developing the new titanium press, Missouri Metals contracted Valtech Hydraulics Inc., St. Louis, MO, to design the hydraulics, which in turn subcontracted to John Henry Foster Inc. (JHF), also of St. Louis, to implement the electronic controls. For the electro-hydraulic motion controller, JHF’s engineering staff needed a unit that could control both position and force, and transition smoothly between these modes. The controller also needed to be capable of synchronizing the motion of multiple axes, which must move simultaneously. To fulfill these requirements, JHF recommended using a RMC151 motion controller available with eight axes of control (Fig. 2), supplied by Delta Computer Systems, Inc., Battle Ground, WA. The hydraulic press operates at 1700 F, with its platens containing heaters to soften the titanium for forming. The parts must be pressed in stages, and should the forming proceed too quickly, part material can crack. The solution: Close the press so that the platens just touch the part material, and initiate a preheat stage to make the titanium pliable. The press ram then moves a few inches with that position held for a certain time period, after which the process repeats. During the final forming stage, a prescribed force is applied, which can be as much as 400 tons. Fig. 3—As this diagram shows, one motion-controller feature, a method called cascade control, uses the output of one control loop to provide the target for another loop. With Missouri Metals’ press design, the inner loop run by each of the four individual cylinder axes is responsible for ensuring that its cylinder extends to the required position and delivers the set amount of force. The outer loops are responsible for determining the total response of the entire press system. The four cylinders in the new press mount beneath the lower platen and push vertically to close the press, which is capable of operating in two modes—full-platen mode to press a single, very long part, or split-platen mode to independently press two parts. 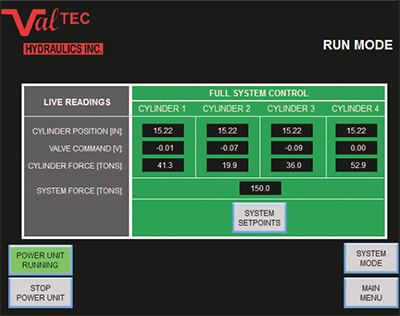 Setups for both modes employ features of Delta Computer Systems’ RMCTools development software, which drives the RMC151 motion controller. One of these programming features, custom feedback, enables the motion controller to perform mathematical or logical operations on a feedback value, or combine the inputs from multiple feedback sources. The result is then incorporated as a single feedback value into the closed-loop control algorithm. In Missouri Metals’ press system, cylinder positions must remain level during press operation. 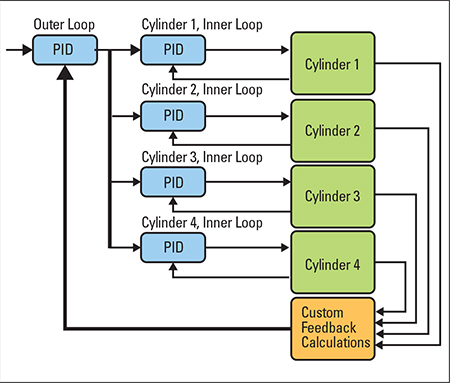 To accomplish this, custom feedback averages position inputs from the four position transducers, which provides a target position for all cylinders to hit during the next control cycle. In addition, individual force values derived from each cylinder’s differential-pressure transducers are summed to calculate the total system tonnage value, which then is compared with the force target value in the controller for use in the controller’s own closed-loop force calculations. Another feature, a method called cascade control, uses the output of one control loop to provide the target for another loop. With Missouri Metals’ press design (Fig. 3. ), the inner loop run by each of the four individual cylinder axes is responsible for ensuring that its cylinder extends to the required position and delivers the set amount of force. The outer loops are responsible for determining the total response of the entire press system. As described above, the target generated for the outer position loop, using custom feedback, is used to keep the cylinders perfectly level, while the target generated for the outer force loop ensures that forces exerted by each of the four cylinders add up to the predefined force set point. The inner and outer control loops run simultaneously, yet are independent of each other. This results in a perfectly level press platen, delivering the set amount of force with no mechanical guides. Fig. 4—A touchscreen operator interface connects via Ethernet to both a PLC and the motion controller for operator messaging, power-unit control, sequence control, and real-time monitoring of cylinder positions and forces. Setting up cascade control involves dedicating two of the controller’s motion axes to each cylinder, the inner loop set as a regular and faster closed-loop control axis and generating an output to the cylinder’s proportional valve, with the slower outer loop set as a ‘cascade’ axis, whose control output is used internally by the motion controller to provide a motion target to the inner loops. The overall system is controlled by writing commands to the outer-loop axis. All of this functionality is set up via simple write operations to registers within the RMC151, so no complex motion programming is required. The press uses feedback from linear magnetostrictive displacement transducers attached to the sides of the cylinders to measure the position of each cylinder, and pressure transducers mounted in the cylinders, one on each side of the piston, as feedback to measure the force being applied by each cylinder. The outputs of the motion controller connect to four proportional servo valves that operate the cylinders. During the initial steps of the cycle, the motion controller is set to control the position of the outer loop, ensuring that the individual cylinders are level while monitoring and limiting the total force being applied. The final step seamlessly transitions to force control, ensuring that the press applies the specified tonnage. “We’ve now got absolute control of position and pressure, so we can run four cylinders simultaneously, or we can run two different press functions at the same time, and get a perfect part every time,” explains Moore. The press system also contains a PLC for supervisory control. 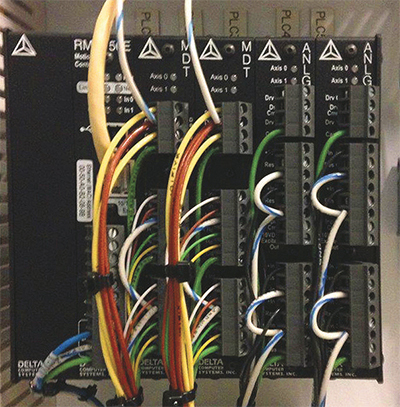 The motion controller connects to the PLC via Ethernet for PLC functions that include storing recipes, downloading motion instructions, monitoring motion results and monitoring the power unit. A touchscreen operator interface (Fig. 4) connects via Ethernet to both the PLC and the Delta RMC for operator messaging, power-unit control, sequence control, and real-time monitoring of cylinder positions and forces. Missouri Metals’ older machines weren’t capable of maintaining this level of precision because the quality of production was heavily dependent on the machine operator.